2nd Grade Boys - Undefeated and Tournament Champions! 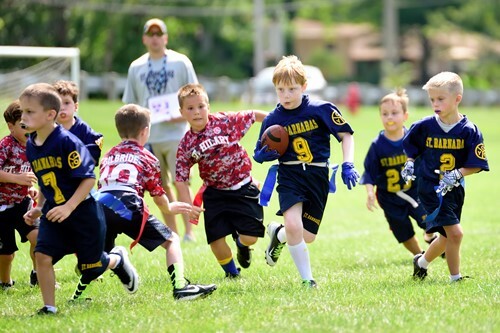 St. Barnabas offers flag football to children in grades 1-3, and tackle football for those in grades 4-8. Both football programs, which start in August and host two practices a week, focus on individual skills and working together as a team. Flag football is made up of 6 players on the field at a time, while tackle football is traditional 11v11. All tackle coaches are USA football certified. Games are held on weekends at local schools. Both programs can also participate in exciting tournaments held at the end of the season.